One of the Dutch traditions in May is ‘Woensdag Gehaktdag’ (a term so nice I won’t translate it). Every year, on the third Wednesday of May, the government justifies how it has implemented the budget in the last year, and the day the opposition fiercely criticises any misallocated cents. Throw in a mix of economic, social, environmental, trade and a few extra indicators, and you get a detailed picture of what wellbeing looks like. Where data is available, the Dutch performance is also compared with other EU countries. Overall, the Netherlands has a high level of quality of life. Many indicators show a positive trend over the last eight years, or a positive change with the year before. Only three out of 21 indicators were markedly negative: the number of people with obesity, satisfaction with free time, and size of nature areas. Nonetheless, the figures aren’t equal. Some groups report lower scores: women, some ago groups (below 25 and 55-65), those with low education levels, and migrants. Here’s the crux: wellbeing scores are clearly higher in the here and now then they are in the future and for the impact on elsewhere. Indicators concerning the future that post lower scores are primarily the environmental ones: CO2 and nitrogen emissions, fossil energy reserves, and biodiversity. Possibly, policy changes may see improvement here in the future, as energy is becoming cleaner and the Netherlands is due to stop all domestic gas production. However, the Netherlands large agro-food business has a massive and unsustainable footprint. You don’t directly see these negative externalities in simple indicators like GDP – a clear example of the value of the Monitor. Another tricky piece is that current wellbeing is also connected with a negative impact in third countries. The Netherlands has a large carbon footprint and imports resources and biomass from elsewhere, including from least developed countries (LDCs). That means that natural capital is moved from those countries. 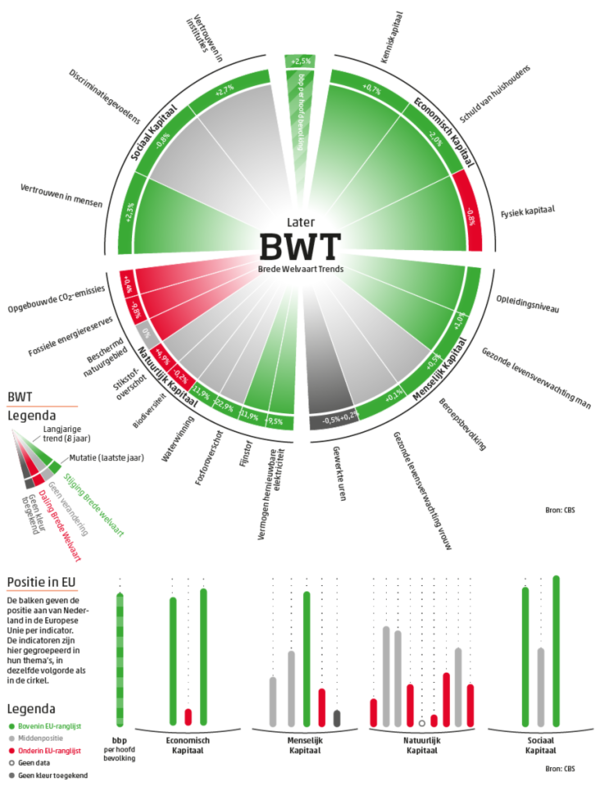 Broad Wellbeing Monitor, ‘Later’. Source: Dutch Statistics Agency. Key: the graph evaluates the impact on wellbeing later across four categories: economic, human, natural, and social capital. Green/red represents positive/negative 8-year trends or 1-year net changes. The lower part of the graph shows how the Netherlands stand compared to fellow EU countries. The report is a new annual feature, and should become a high-profile publication with an impact on policy formulation. For that, we go back from the statistics agency to politics, to the MPs and the cabinet we have mandated to make choices for us. This Wednesday will see the Parliament evaluate the government’s performance in a plenary debate, and MPs can use findings of the report to encourage the government to reshape their priorities. In this way, they can make the Netherlands a happier place, not only now, but also later and elsewhere. In the three years I’ve been writing this blog, I’ve travelled around the world to explore happiness: from Denmark to Mexico and Bhutan, and from Costa Rica to the United States (well, the latter two only in spirit). But so far, I never wrote about my own home country, the Netherlands. That’s not because there is no interesting debate on happiness in the Netherlands. The Netherlands always scores high in the international rankings (seventh in this year’s World Happiness Report, and fifth last year). It is home to the first Happiness Professor, Ruut Veenhoven. He was one of the first academics to seriously study happiness and his university hosts the World Database of Happiness (I’ve been told their team has identified 963 ways that have been used to measure happiness). A Unicef report often quoted in press demonstrates that Dutch children are the happiest ones of the (rich and developed) world. And beyond that, I’ve come across a lot of great projects on happiness, from happiness budgets for socially deprived people to happiness trainers and from happiness in civil community work to activists for environmentally sustainable happiness. The Dutch appear to be a happy few! What does Rutte mean by this? From the 1960s to the 1980s or even longer, many in the Dutch political elite believed in the idea of socially engineered society, or in Dutch, the ‘maakbare samenleving’ (‘society that can be made’). This idea presupposed that government intervention could achieve a lot to improve people’s lives, the quality of society, and happiness levels. Over time, in the Netherlands like elsewhere the mood has shifted to a society where people are responsible for their own lives and the state does not interfere with people’s personal sphere. Happiness, or quality of life, is seen as a purely personal issue. In my view, that is too simplistic. In the Netherlands like in Denmark, it just appears that we are getting many factors right. Neither Denmark nor the Netherlands has comprehensive happiness policies, but in both countries the quality of education, healthcare, social security, and trust are amongst the highest of the world. That is something to cherish, but rather than an endpoint, it should be something to build on. Instead of developing a vision and a framework on quality of life – such as in Bhutan’s Gross National Happiness, but also in the UK’s government’s programme to measure well-being, the Netherlands has resorted to another strategy: happiness by reports! It isn’t the only one to do so. The French Sarkozy government commissioned the appraised but never implemented 292-page report on the measurement of economic performance and social progress. The German Parliament outdid the French Committee: it published its own report of no less than 844 (!) pages on Growth, Wellbeing and Quality of Life). The Dutch response came this year. In April, a Parliament Committee published its own report ‘Broad Concept of Progress‘ (Breed Welvaartsbegrip), which it managed to keep just below 100 pages. The Committee set out in an exercise with three aims: to determine what GDP measures and doesn’t measure, whether there is value in broader concepts of progress, and to propose what these concepts should look like. The Committee does see value in using broader concepts, and evaluates international efforts, like the OECD’s Better Life Index, the EU’s Beyond GDP agenda, or statisticians’ guidance aiming to measure subjective well-being in a more harmonised way. At the same time, it acknowledges the efforts are still very divergent. The report also points the work in the Netherlands itself via the Monitor Sustainable Netherlands (Monitor Duurzaam Nederland) prepared by the Dutch Statistical Office and three advisory bodies. Ultimately, the Committee does not make a clear choice in answering the question how progress should be measures. Instead, it comes with three recommendations. Firstly, to broaden the Monitor Sustainable Netherlands to turn it inot a Monitor Broad Wellbeing, and provide annual updates of the level of general wellbeing in the Netherlands. Secondly, these annual reports shouldn’t end up in a drawer or the fireplace, but be debated with the government in a parliamentary debate. And finally, the Dutch government is called to contribute to the convergence of all various international efforts in wellbeing indicators. The report doesn’t contain a great ambitious vision, but aims to set a pragmatic and practical agenda. In a debate with MPs today, the Committee seemed to have support for this approach. Hopefully, the Netherlands is making a good choice today. There’s merit in not entering too deeply into the ideological discussions on metrics, as these often arise in arguments of the kind of ‘my index is better than yours’. Instead, by putting the issue on the agenda annually and contributing to find an end in the international labyrinths, the Netherlands may slowly edge closer to develop a vision on happiness. A trip of one thousands miles to happiness starts with the first step. 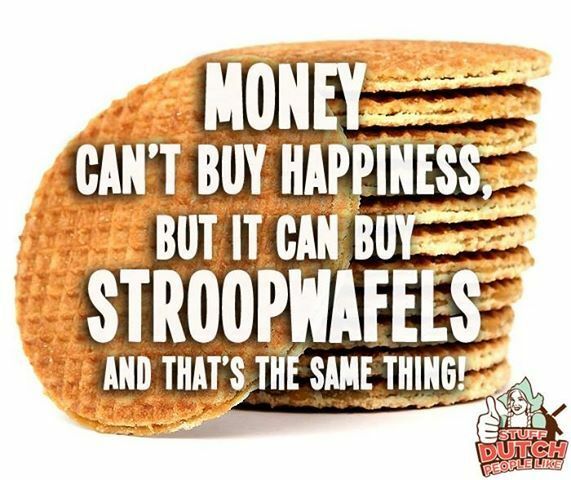 Even if the Dutch state won’t be a happiness machine anytime soon, it has started a journey.